Essential Skills--Made Easy! 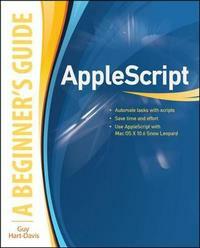 Learn to program in AppleScript, the versatile scripting language built right into Mac OS X and supported by most major applications. 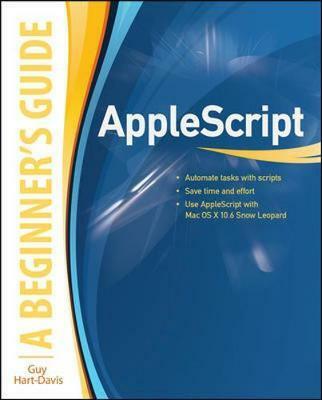 AppleScript: A Beginner's Guide shows you how to write powerful scripts with the AppleScript Editor to automate tasks, save time and effort, and automatically generate documents, spreadsheets, and e-mail messages. Debugging and error handling are also covered in this fast-paced tutorial. Designed for Easy Learning Key Skills & Concepts--Chapter-opening lists of specific skills covered in the chapter Ask the Expert--Q&A sections filled with bonus information and helpful tips Try This--Hands-on exercises that show you how to apply your skills Notes--Extra information related to the topic being covered Tips--Helpful reminders or alternative ways of doing things Cautions--Errors and pitfalls to avoid Annotated Syntax--Example code with commentary that describes the programming techniques being illustrated Ready-to-use code at www.mhprofessional.com/computingdownload Guy Hart-Davis is the author of Mac OS X Leopard QuickSteps, How to Do Everything iPod, iPhone, & iTunes, Fifth Edition, HTML, XHTML & CSS QuickSteps, and several other computer books. Guy Hart-Davis (Barnard Castle, UK) is the author of more than 60 computer books, including all editions of How to Do Everything: iPod, iPhone, & iTunes, iPad and iPhone Administrator's Guide, Integrating Macs in Windows Networks, and Mac OS X System Administration.